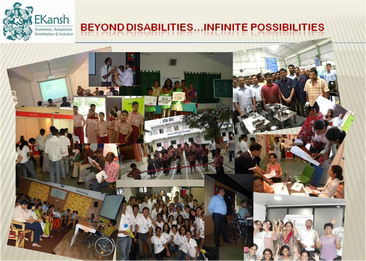 ﻿﻿EKansh believes that any Disability needs to be understood holistically. We have therefore followed the sequence of Awareness, Acceptance, Sensitization and Inclusion. Our activities are broadly outlined below. If you would like to know more, please browse through the photographs on various pages in this website or write to us at info@ekansh.org. * These workshops last anywhere between 2 hours to a day and we use interactive methods to ensure better understanding of Disability related issues. Recommended by Maharashtra State COMMISSIONER FOR EMPOWERMENT OF PwD for Awareness and Training workshops. ﻿*Our workshops are tailormade for different groups and are impactful and greatly appreciated. They are interactive and fun while being educational. > We have published a coloring book and a story book for children of all ages. Both these books aim at sensitizing the developing mind to make it more inclusive and empathic. *We conduct job fairs every two years. The efforts for placement continue through the year. Weekend workshops aimed at teaching participants to have a basic conversation in Indian Sign Language. Reaching out to health workers in Slums and rural areas through our early awareness booklets. Encouraging prevention, early detection and early intervention. Early intervention is imperative once a disability is detected. Delay in acknowledgement and positive action can lead to a lifetime of dependency and struggle.